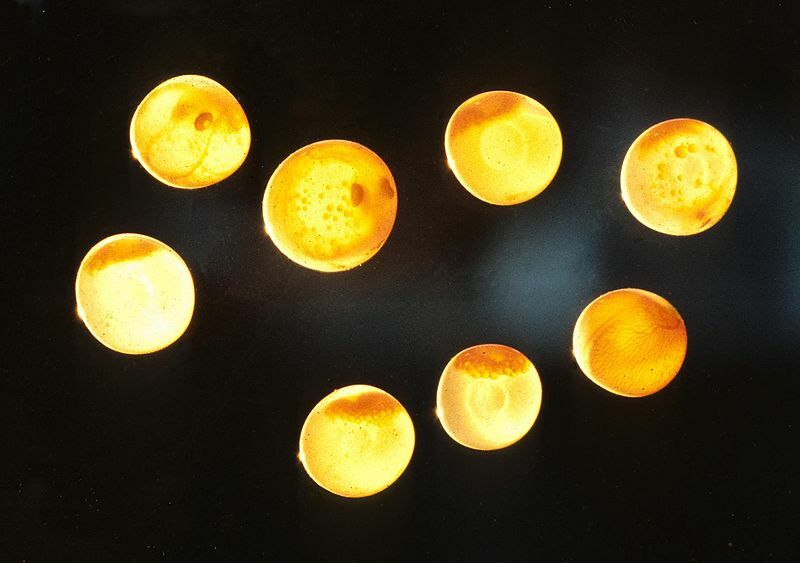 Salmon eggs in various stages of development. There were always going to be winners and losers in the current flux of climate change. One of the unexpected winners seems to be pink salmon (Oncorhynchus gorbuscha) of the Pacific Ocean. Warmer water temperatures have been leading to a higher survival rate the prey of the pink salmon fry, and the numbers of pink salmon have increased dramatically over the past forty years. Zooplankton, squid and mackerel profit from higher temperatures, and the omnivorous pink salmon – one of several different salmon species in the North Pacific – profits from an abundance of food. Unfortunately, some of the animals that share the diet of the pink salmon are faring less well. Kittiwakes, puffins, even whales and other salmon species, are losing out. It turns out even fish can overfish the ocean. Now the discussion is turning to conservation management issues – what to do if one of the species being managed through fishing catch limits is outdoing too many other competitors in a complex marine ecosystem. Pink salmon spawn in the Indian River, Sitka Valley, Alaska.